© 2018 Liquidware Labs, Inc. All Rights Reserved. Many Imprivata and Liquidware healthcare customers are delivering secure virtual and physical desktops with Single Sign On, robust User Environment Management, and Application Layering capabilities. Imprivata OneSign gives care providers fast and easy access to their Citrix- or VMware-based virtual desktops. By replacing repetitive manual log-ins with automated processes, Imprivata OneSign helps providers obtain information more efficiently, so they can spend more time with patients. By combining desktop virtualization with single sign-on, hospitals can provide clinicians with a roaming desktop that follows them throughout the day – increasing their productivity, satisfaction and overall adoption of electronic medical records. 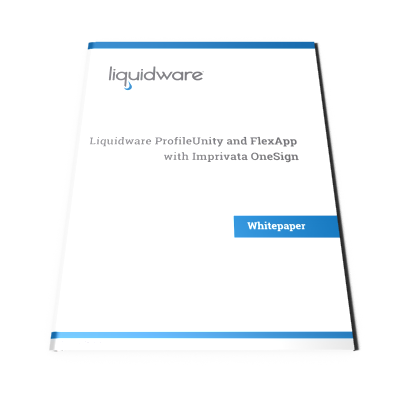 ProfileUnity and FlexApp enable both full User Environment Management and optional Application Layering for any Windows desktop including Citrix and VMware-based virtual desktops. ProfileUnity enables a follow-me persona that can automatically detect the location and context when a healthcare staff member signs on to the desktop or workstation through traditional means or with Imprivata OneSign. The user’s profile, policies, access to data and location-aware printing are then instantly configured. Additionally, desktop/workstation features can be locked down to ensure the desktop and environment remains secure and that compliance regulations are kept intact.